No operator ever wants to experience an emergency shutdown (ESD. Not only does that mean something went wrong on the line, but if the critical shutoff valves malfunction, it also could place personnel and the environment at risk, not to mention putting a heavy financial burden on the company. The failure of these valves in crucial moments can be catastrophic, potentially rendering useless a Safety Instrumented System (SIS), put in place to reduce the possibility of an accident. Though static or dormant for long periods of time, these valves must work when the time comes and operators do not want to question the reliability of the installed control equipment. Therefore it is important that some type of valve monitoring takes place within the processing plant on a consistent basis, and partial stroke testing (PST) has become the go-to method. There are three PST techniques currently available, each offering different benefits, but all contribute to increased confidence in the equipment. But which one is best for emergency shutdown? Thanks to continual advancement in smart technology, a new PST method has emerged as the most comprehensive solution for ESD applications. Representing an evolution in valve testing, digital control transmitters combine the features and benefits of other PST techniques to offer a broader diagnostic ability, an easier implementation, and a more cost-effective maintenance programme. While not yet completely understood or adopted, their benefits offer solutions at key pain points in ESD which cannot truly be grasped without first reviewing PST in detail. Partial stroke testing allows processing plants to test the installed base of valves without having to actually close the valve and shut down the plant, as is the case with Full Stroke Testing (FST). Through PST, the valve’s movement is checked via position control devices and only the most critical failure modes are tested. During the PST, should a valve not move out of its end position within a specified period of time, the test is cancelled and an alarm is output, thus ensuring a blocked valve does not go unnoticed. Before PST was introduced, FST was the sole monitoring technique available. However, since this method required a complete plant shutdown, it was not only costly, but valves weren’t being tested as frequently, leading to more emergency shutdowns as a result of isolation valve failures. This testing method also did not offer any diagnostic insight into what was happening inside the valve, unlike the PST techniques of today. Now certain PST methods, including those that utilise transmitters with pressure profiling, are able to provide valuable predictive maintenance data (i.e. the occurrence of valve friction) that can assist maintenance teams in prioritising tasks and implementing corrective action before it becomes a problem. Thus, if repairs are needed, a scheduled, non-emergency shutdown can be implemented or the valve can be temporarily bypassed. By implementing a routine PST process, the SIS is protected and reliability of the isolation valve is improved, resulting in longer periods between required FSTs, and reduced maintenance costs. For many years, there were two PST techniques available, each offering specific benefits for different uses. Firstly, mechanical jammers are the simplest and least expensive option. They are highly reliable because of their ability to resist vibration, but they are also the most manual option, requiring the device to be physically inserted into the valve assembly to prevent it from closing completely. This manual placement is subject to human error, placing the entire process in jeopardy of an accidental full stroke. This technique also poses a problem should an ESD occur during the PST process. The second, more popular technique employs a modulating valve controller, or smart positioner. This is a more innovative technique that utilises modern technology to automatically generate the PST function, either locally or remotely. 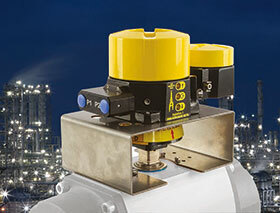 Smart positioners monitor valve movement proportionally, measuring the speed of its response and its position. It is capable of cancelling the test should the response not occur within a specified period of time. They typically have a small flow factor, making them appropriate for applications where valve movement is very small. This poses a problem in the ESD application because when a valve strokes during an emergency shutdown, it is generally required to move from a fully opened state to a fully closed one rather quickly. To compensate, solenoid valves (SOV) can be installed to achieve the required closing time, venting the actuator at a faster rate to close the valve. However, the SOV is not always tested during a positioner-based PST, which poses the original problem of potential malfunction because problems are not identified before the ESD valve is needed. Additionally, smart positioners do have the ability to capture diagnostic data for use in maintenance, unlike mechanical jammers, although they will not capture the ESD event. To compensate for this, limit switches or additional transmitters can be utilised, thus requiring the installation of even more equipment. The third and most comprehensive PST technique utilises the solenoid valve. As the final element that is called upon to ensure the valve returns to a safe state, the SOV needed to be tested along with the valve/actuator combination which was not possible with the smart positioner-based PST method. When originally introduced to the industry, the SOV-based PST method involved an operator physically pressing and holding a switch to de-energise the SOV to relieve air from the actuator and allow for valve movement. It was the operator’s responsibility to visually monitor the movement of the valve and release the switch once the movement was confirmed. Though it allowed for SOV testing and did not require an expensive positioner, this labour-intensive technique had several drawbacks, including variability in operator decision making, the potential for holding the switch too long and causing a shutdown, and the risk of human error in the manual recording of the event. So over time the technique was improved upon, which brings us back to the digital control transmitter. The digital control transmitter is an automated SOV-based PST technique that can functionally test the complete automated valve package, including the SOV as already described, either locally, remotely or on-schedule. Additionally, it has the ability to capture diagnostic information on the valves (including the ESD event), as well as the FST, solving problems posed by both mechanical jammers and discrete valve controllers (smart positioner). How it works: the digital control transmitter confirms the valve position prior to start and the SOV is de-energised through a solid state relay. The air is relieved from the actuator while the device’s electronics monitor the valve position changes. The SOV is re-energised at the correct moment to re-open the valve after a predetermined percentage open is achieved. This process reduces or eliminates the active labour requirement of the previous process, increases precision to the desired PST set point, decreases the potential for over travel and provides electronic reporting and feedback to control the system. Digital control transmitters can be mounted to rotary and linear valves and are approved for use in hazardous areas. With only a few suppliers offering this solution, one in particular has been leading the way with advanced products that have expanded on these benefits and provide even more diagnostic features. Westlock Controls has an intelligent valve position transmitter called the Digital EPIC-1. This product offers discrete position control, as well as reliable, non-contact position feedback with digital communication via HART protocol in an integrated package. Recently, the company launched its second generation Digital EPIC-2 product which introduces pressure profiling technology to monitor the supply and actuator pressure, confirming adequate supply pressure prior to initiating the PST. Unique in the added features it offers, the Digital EPIC-2 can record multiple variables, including the time and pressure required to break from the full open position, providing an early indication that there may be an issue with the valve/actuator integrity. The Digital EPIC-2 also has improved electronics and complies to the most current HART 7 protocols. The most interesting of the expanded features offered, and an approach unique to the Digital EPIC-2, is the ability to record valve signatures before and while the valve is functioning in the process line. Users can review maintenance and baseline signatures on their host system via DD/DTM technology to make determinations on valve health and schedule maintenance accordingly. Integrator and installation signatures are also available. When the valve is tested at an assembly shop prior to going on site at a plant, the integrator signature would be generated to ensure the whole package was tested and functioning when the digital control transmitter was integrated with the valve and actuator at the distributor location. The final installation signature is generated while installing the integrated valve package in line, assuring traceability of the entirety of the valve package commissioning process. To summarise, the digital controls transmitter is designed to combine continuous monitoring of valve travel with other valve control functions to keep the operator continuously informed. With more advanced product offerings, the level of diagnostics that can be captured has been elevated, enabling plant operators to make better assumptions and informed decisions regarding their ESD maintenance programs. Plant operators who have experienced problems with PST in the past, or who have not implemented it for various reasons will find digital control transmitters to be an effective and easy implementation compared to other techniques. Being able to predict maintenance needs before they are required can save costs and enable plant operators to implement more efficient, proactive maintenance programmes as opposed to reactive ones.